We all want our boys to be happy and get what they want out of life. But sometimes we don’t know how to help boys meet their goals. Wouldn’t it be great if they could meet just about any goal they put their minds to? Well, it is almost that easy if you use these techniques along with ones wonderfully resourceful brain. Have you ever heard of the reticular activating system (RAS?) Perhaps you studied it a bit in school. I don’t remember doing so myself but it is really interesting and we can all use it to meet our goals. It works a bit like this. If, today, you go out for a drive and we had just had a conversation about red cars you would suddenly see red cars everywhere. Did red cars materialize out of nowhere? Of course not, we are focused on them and so we notice them much more. BTW, sorry if you see a ton of red cars now. We can use RAS and focus to help ourselves and our boys move toward specific goals. Neat, right?! Read on to learn more. I like to read about learning and how the brain works – I’m a tad odd that way lol. However, that is why I ended up starting this site, so it is a good thing. Some time ago I was reading about the brain and meeting goals and RAS came up. Here is some information about how the reticular activating system actually works. RAS is the area of the brain where information enters. Then, and this is key, RAS filters the information so you don’t have that firehose effect of information blasting over you so fast that can’t even think. It helps keep you from being overwhelmed. Where this comes in super handy is in goal setting. Think about it this way . . . you cannot meet your goals if you are not focused on them. Focus is the key word for goal setting. Focus is what can be used to move you toward, or away, from the goals you have. If you are thinking about the wrong things, you may drift from your intended goal. Thoughts matter. Here are five tips to help boys meet their goals by using their natural RAS to move them forward. Some would go so far as to say to move them toward the life they want to live. Keep in mind that our boys are young. There are plenty of adults who are terrible at goal setting and just go by day to day, unhappy with their lot in life, but not really doing anything about it. The reason I am writing this is so that you can help your boys learn a better way. However, I will repeat that they are young, so share this information with them, help them learn it, help them adapt it . . . but don’t push. Have a laser focus on the goal. Get your boy to flesh out his goal so he is very clear what the end goal is. In this case you don’t want to go with “I want to get a good job” or “I want a new bike.” You want to help him to narrow things down more and go with something like: “I want to get a job in the Aerospace field as an engineer specializing in navigation and control.” Get specific. Or if you have a younger boy and he wants a new bike have him focus on exactly what he wants. He could say, “I want a Wethepeople, silver Arcade BMX bike with with SALT moto brake system.” The more they focus on it, the more likely it will be that they take the actions to make it happen. Think about the goal daily. The more they think about their goal the better. The more thinking that is done about a goal the more likely they are to achieve it. Give him the time and space to think. Write down the goal and keep it visible. If he can see it on a regular basis it will be at the forefront of his mind. Tips: write it every morning, put a slip of paper with the goal on it where you can see it, put another one in your wallet, write it big and hang it on a wall – you get the idea. Believe he can achieve. Henry Ford said “Whether you think you can, or you think you can’t–you’re right” It has been proven that if you believe you will fail, you will. If you, on the other hand, believe you can do it, most of the time you can. Watch what your boy is saying about himself and help him direct his self talk in a positive way. Have him think about his goal and imagine it to be true. Athletes do this all the time! On another note – watch what you are saying to him as well! Do you believe in him? Do you tell him you know he can achieve his goals. Do you let him know you are there to help him? Be open to what RAS produces. This means that because he has this laser focus on his goal, he (and perhaps, you do as well because you are thinking about his goal) will start noticing little things that come up in relation to that goal. This is our brain filtering information and providing the information you need. Perhaps one of you will meet someone who knows someone who does exactly what he wants to do. Or he is surfing the Internet and reading about something related to his goal and he clicks through on a few links that lead to a key piece of information that propels him forward. One always has the choice to dig deeper or skip it. Tell him to keep his goal in mind and follow the leads that come up. Here is a quick video to visually explain what RAS can do. Ignore the picture of the weird eyes – what is with that? I read Entreprenuer magazine and this article from Entrepreneur magazine’s website has more about RAS if you are interested in learning more. Using your built in RAS works. Top leaders, athletes, entreprenuers and many others use it all the time. They set a goal and believe me when I say that they have a laser focus on that specific goal and that is part of the reason they succeed. They obsess about, think about and talk about their goal. They know they can will achieve it. They believe in themselves. They watch for openings that will help them on their way and jump at those opportunities. 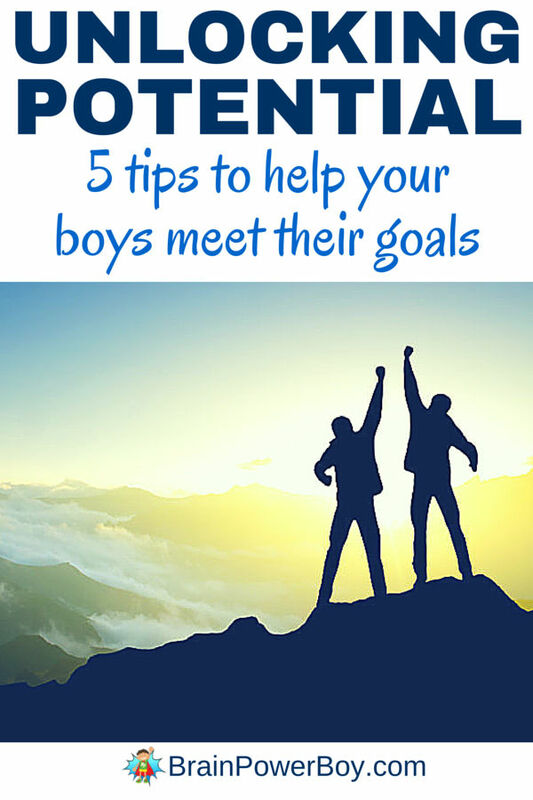 If top leaders can do it, so can your boy and you will be there to help by using these 5 tips to help your boy meet his goals! For more articles like this one go over to our Boys’ Learning page and browse around.